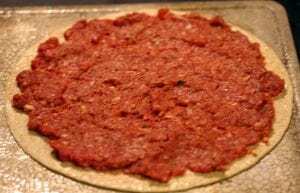 Pronounced “leh-meh-zhoon” and spelled many different ways, such as lahmajoon, lahmacun, lehmejun, lamajun, and Լահմաջուն, is a tasty meat pie popular in Armenia and Turkey and literally translates to “meat dough”. This dish cooks up quick, making it a nice snack or fast super, especially by using flour tortillas as the base (traditionally the dough is also made from scratch). I must admit, I found the basis of this recipe, “Weeknight Lehmejun”, in a Taste of Home Magazine (Nov 2017) given to me by a family member. 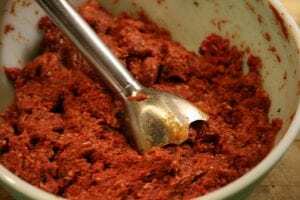 Soon after, I was given a jar of homemade red pepper paste and the idea came together to create a venison version of this recipe. The mixture of tomatoes, peppers, and spices compliments the venison flavor and is especially good with a squeeze of fresh lemon on top. 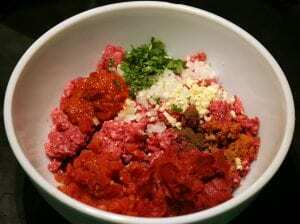 Mix venison, tomato paste, tomatoes, red pepper paste (or diced peppers), garlic, onion, parsley, paprika, cinnamon, allspice, sumac or lemon juice, salt and pepper, and a pinch of cayenne if you like heat in a bowl. Pulse with an immersion blender or in a food processor until everything is very well chopped, but still has some texture. 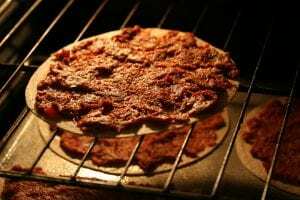 Spread a thin layer of the meat mixture onto flour tortillas almost all the way to the edge. Bake directly on the oven rack for 8 to 10 minutes, or until the edges are browned and the meat is cooked through. If the tortilla begins to inflate in the oven, pop it with a fork from the top. They could also be cooked on a cookie sheet lined with parchment paper for easier transfer in and out of the oven. To serve, squeeze some lemon over the top, sprinkle with fresh mint and/or chopped lettuce, fold the “pizza” into quarters, and eat out of hand. Yum! Multiple recipes noted that lehmejun can be cooked and stored in the freezer by layering them with wax or parchment paper and placing stacks in a large freezer bag. The meat can also be browned in a skillet and served in a lettuce leaf wrap, which is a healthy way to use up any leftover filling.